How to Sing in Tune — How Good Is Roland’s New Vocal Trainer? How do you get two guitar players to play in perfect unison? How do you know if the stage is level? The drummer is drooling from both sides. What do you throw a drowning bass player? How do you know there’s a singer at the door? We all just want to get better. We’re searching for the tools that will make us ridicule proof, at least. Though there are thousands of video tutorials, and many books on the market to help singers, there is not much practice gear available to assist the vocalist, as there is for other musicians. 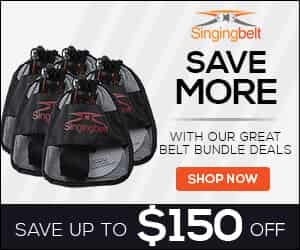 I learned this as I started to market the Singingbelt (a training device I created to help teach singers diaphragmatic breath support and how to understand breathing for singing). Retail stores, at first, weren’t sure where to put it. That’s changing now as more companies like Roland and Hal Leonard are examining the vast numbers of singers who want to learn how to sing better and are willing to spend money on gear that will help them. 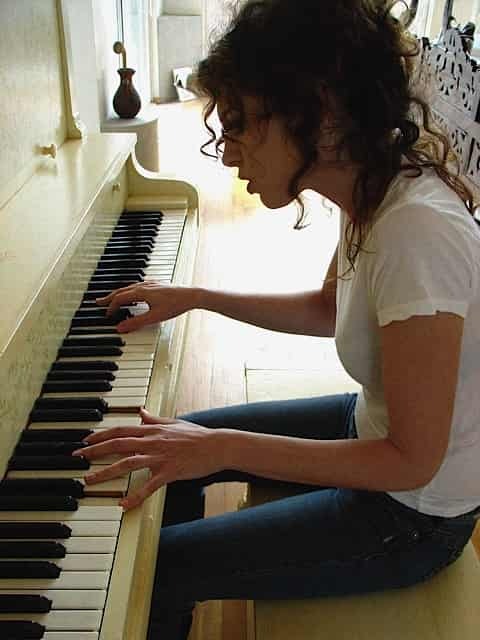 The cost of vocal lessons from reputable vocal coaches is considerable. Most singers would agree if there’s a piece of equipment that can accelerate my progress and improve my voice, I’m willing to try it. My first thought looking at the new VT-12 Vocal Trainer (Roland) was that the cost was pretty steep for what I thought it was ($199), but after having spent some significant time with it, I’d say it’s worth it. The content included with the chromatic tuner and digital recorder is expansive. The chromatic tuner itself works especially well with fast moving input of vocalises. I compared the response time with several other chromatic tuners, and chromatic tuner apps, and it works better for vocal warm-ups and exercises than a typical tuner which is intended to help tune one note at a time for guitar, violin, etc.. (I did like using the insTuner free app, if you’re just getting started, this is absolutely worth downloading and using.) The Roland VT-12 is not immediately intuitive to follow. If you’re a singer versed in zero music theory, you might feel completely lost as you start. If you give it some time, and begin with the easier exercises, you should get the hang of it within a week or so. You need to know a bit about scales in order to understand how to use the Vocal Trainer. It would be helpful if the product came with an instructional DVD for beginners. There is a tremendous amount of variety in the content programmed into the device itself (vocal warm-ups and vocal exercises). Almost 100 exercises both played with a singer giving the example, and then again without. Almost priceless for those working on selections from the Hal Leonard Twenty-Four Italian Songs and Arias of the Seventeenth and Eighteenth Centuries, are the examples, and accompaniments to these songs. Having the opportunity to self-monitor your pitch as you go through will help singers perfect and fine tune pitch. Vocalists may still need to turn the device off and use a keyboard to play and repeat notes and vocal phrases, but if you’re attempting one of these arias for high school auditions or college auditions, this tool could make the difference for your practice and performance. The cherry on top, is the included booklet by Anne Peckham. If you can’t attend her class, the is an excellent alternative. Her explanations, instruction and exercises are clear and extremely useful. 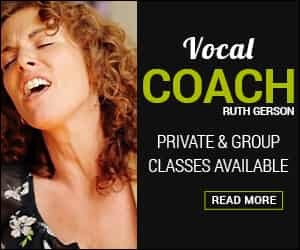 I wish the vocal trainer included more material for the beginner and the new singer who is struggling to find pitch, with more exercises and explanation on what to do when you are out of tune. How to slide and find a note, how to match notes, and recognize when you are singing a harmony note, but not the note itself you are trying to match. Also I wish more of the exercises were broken down into pieces for beginners and then put back together. The vocal trainer, I think, is aimed for the experienced and advanced vocal student. If you’re a singer who has never looked at a chromatic tuner to begin with, you might feel overwhelmed and most of the vocal exercises would feel extremely challenging. I wouldn’t recommend it immediately for beginner singers, however, if you are a beginner and decide to try it, scroll through the exercises, some are easier than others. The Latin Vocalise is a easier place to start than the Rock Steps, for example. Give yourself some time with it before you give up on it. Attempt to just match notes with the chromatic tuner. It’s a device you may be able to grow into. You can generate a tone and match it with the tone playing, sliding up and down, if you need to, until you find the pitch. Then you can turn the tone off and try to match it. Try with and without the tone generator several times, and then ascend/descend half step by half step using the sharp (#) and flat (b) keys. If you are new to singing or even if you’re not, read through Anne Peckham’s booklet before you begin and do all the stretching and breathing exercises before you start. This truly is an excellent tool. I hope it becomes a little more affordable to reach a broader group of singers. That being said, is it worth the cost of a couple of vocal lessons? Most definitely.